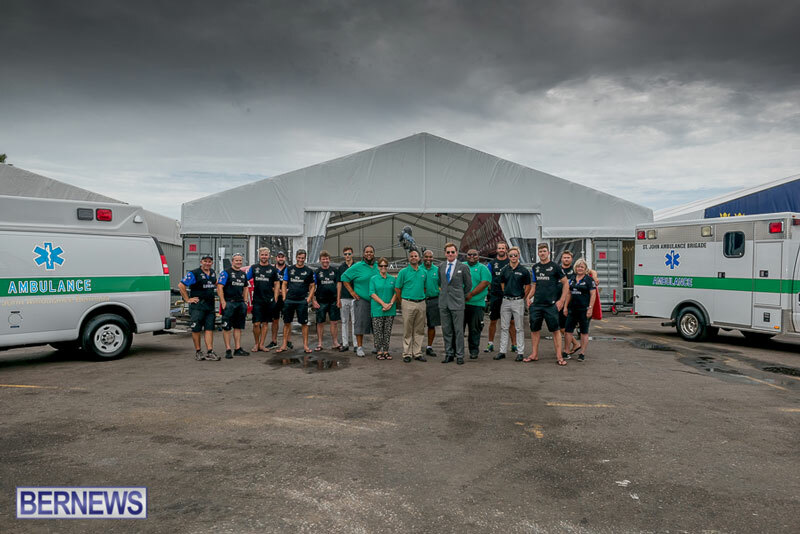 St. John Ambulance Bermuda, a local registered charity, is the ambulance and first aid service provider for the America’s Cup to take place in the Great Sound and Hamilton Harbour commencing this Friday and continuing through Sunday. Justin Williams, Chairman of St. John said, “St. John Ambulance are pleased to be the main ambulance, First Aid and CPR provider to the America’s Cup. “St. John will be providing three ambulances to be in position and on call, on Front Street and at Number 8 dock. St. John personnel will be on the water with the police and other emergency services and will have a member in the command centre in Hamilton. Chairman of St John, Justin Williams with St John members and Team New Zealand. Commissioner of St John Gareath Adderley said, “St. John has served the Bermudian community since 1894 and is dedicated to providing first aid and emergency response support to community events and delivering high-quality medical training to the community throughout the year; with courses ranging from basic first aid to advanced level Healthcare certifications. St. John also supports the Emergency Medical Services professionals of the King Edward VII Memorial Hospital [KEMH]. “We receive requests to attend over 200 community events varying from weekly triathlons and road races, community fairs and church gatherings, to major island wide events such as the Rugby World Classic, International Race Weekend, and the PGA Grand Slam.